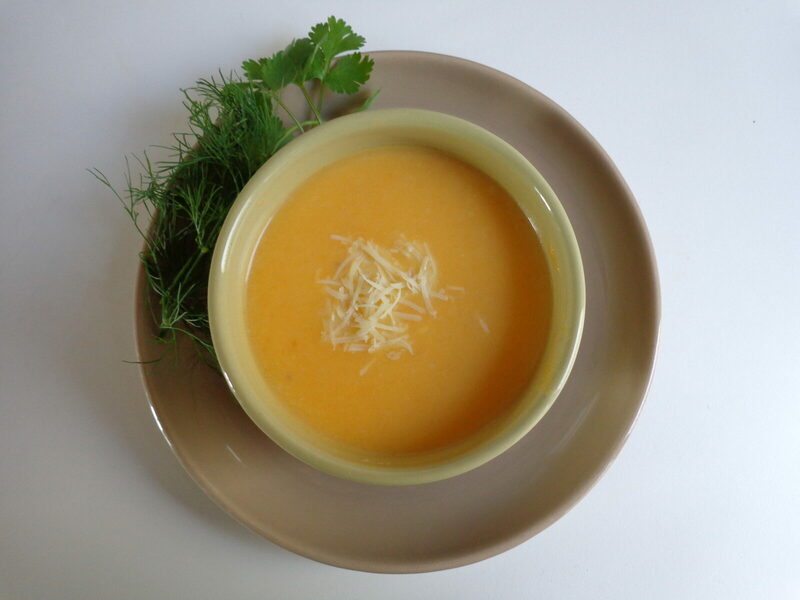 This rich soup of pumpkin, potato, cream and grated Comté cheese hails from Lyon, one of the gastronomic capitals of France. It works equally well as a starter or as the main course of a light meal, accompanied by a green salad. If you enjoy fresh herbs with your soup, as I do, serve them on the side or sprinkle them onto the soup as you serve it. Traditionally, however, this soup is served as is, with a little more grated cheese — and possibly a few croutons — on top. Remove the pumpkin’s stringy interior and seeds. Using a very sharp knife, cut the pumpkin into large cubes. Slice off the rind, and cut the remaining flesh into pieces about 1/2 inch (1 cm) thick. Rinse the leek and slice crosswise into pieces about 1/2 inch (1 cm) thick. Melt the butter in a large soup pot. Add the vegetables and sauté over medium heat for about 5 minutes, stirring frequently. Be careful not to let the veggies brown. Add the water, sea salt and bay leaf, and bring to a simmer. Partially cover the pot and cook until the veggies are very tender, about 30 minutes. Remove the bay leaf. Purée the soup. Return to a clean pot and place over low heat. Add the cream and whisk to blend. Grate the cheese finely and whisk in. Taste and adjust the seasonings as necessary — the soup may need more salt. Using a nutmeg grater, grate in a little fresh nutmeg (too much would overwhelm the soup). Serve piping hot, topped with a little grated cheese if you like, with extra cream and some finely snipped herbs on the side. Serves 4. I made this soup this weekend. It was delicious. My leftover adverse roommate even had some the next day. Thank you Meg.